BlueSoleil 5.0 is a milestone in the BlueSoleil history, with more user-friendly graphical interface. 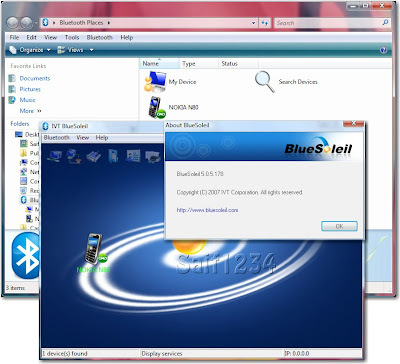 Besides all the features in BlueSoleil Standard version, the biggest change is that BlueSoleil 5.0 has dual graphical interface, classic BlueSoleil GUI and Windows explorer GUI. 1. Support Bluetooth 2.0+EDR and 2.1+EDR. 2. Better support of multiple Windows accounts. Bluetooth devices via the “Send to” popup menu. 1. Send by Bluetooth” and “set as default” functions in Microsoft Outlook. 3. right-clicking the device or service icon. Dragging a device or a service icon and dropping it to the desktop can also create the shortcut. 5. CSR, ISSC main chipset compatible.